June 21, 2002 The first day of summer brought cool breezes and the fourth straight day of rain at the formerly parched and thirsty Cherokee site. Leonard has finished up the sea chest after a lot of drilling, glassing and sanding. 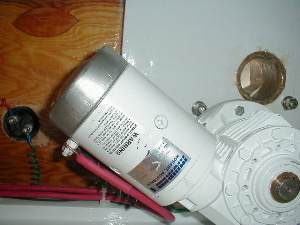 The seacocks for the raw water intakes are installed in the sea chest, along with the strainers and the suction hose to the engine’s pump. The rest of the muffler and exhaust system is now being completed. The anchor windlass has been installed in the rope locker. 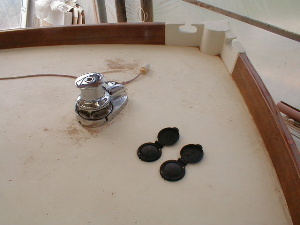 Below left is the windlass shown with up and down foot switch. Right is a view from the rope locker looking up. The interior work rolls along, with Kerry, Jeanette, Jeff and Norm fitting mahogany and varnishing paneling and trim. The trim will receive a total of six coats of varnish. The vanities gets increasingly vain with a marvelous varnish glow. 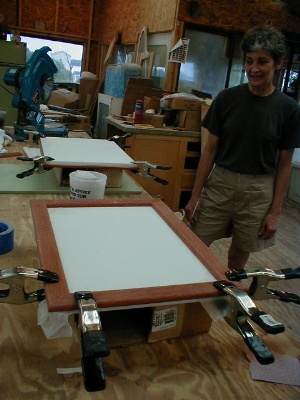 Jeanette is shown below working on her cabinet door project. 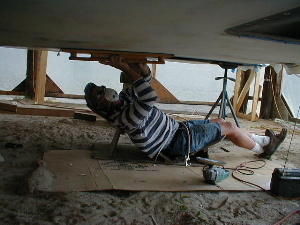 Bill has managed to work on the hardtop between squalls, and is shown below checking for low spots or “indexing”. 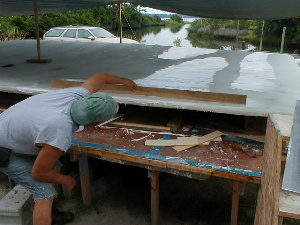 Considerable effort has been taken on the underside of the pilot house roof to insure that it is fair, since this area will be highly visible. 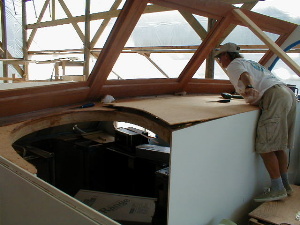 Jeff fitted sashes into the windshield, and is now working on the curved entry hatch from the pilot house to the galley, as well as the entry to the forward hallway and the pilot house wheel bench. 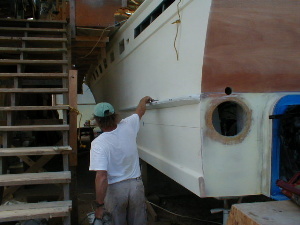 He and Norm have also installed the rub rail on the aft quarters. 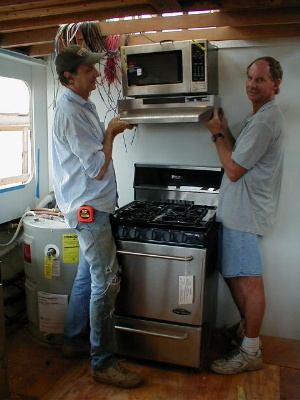 Work in the galley has commenced – our friend Wayne is shown below situating the microwave over the oven with the help of Steve. Bryan can now get an idea what this wall will look like when completed. Since there are no studwalls in a boat, cabinetry has to hide wiring, ductwork, plumbing, sea-mouse condos and many other things. 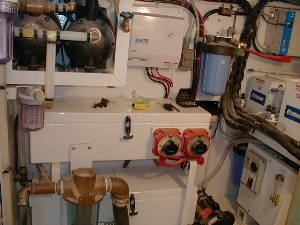 The electrical panel is located directly behind this galley wall, and some of the wire will enter these cabinets and be dispersed throughout the boat.